Bobbles, beautiful yarn and a fun, relaxing pattern? Sign me up! 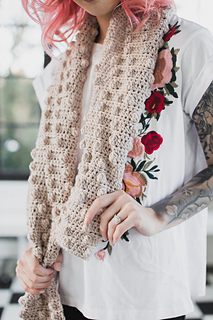 This easy and fun scarf pattern is a perfect on-the-go project that works up really quick! Add texture and style to any outfit with your own Penny Scarf! I’ve been so inspired by bobbles for the spring season because of how playful they can be, and working them up in a diagonal design really adds some great character! This PDF pattern is written for those with basic crochet knowledge. This is considered an “easy” pattern, not beginner. 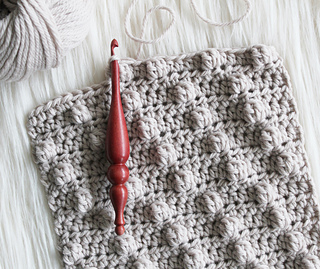 It is a great way to expand your crochet abilities once you master the basics. If you have any questions about this pattern, please join our Facebook group (The Hook Nook Crochet Group). There are many people in that group that have worked on each of Jessica’s patterns and will be happy to help you figure out any part you may be having difficulty with. You will receive help much sooner if you are able to post your question(s) in the group.